Synopsis: A mission to capture terrorists in Kenya becomes complicated by legal, political and moral issues when they are observed preparing for a suicide bombing. The use of drones in modern warfare now means that strikes against our enemies can be waged by a desk-bound technician sitting in front of a monitor thousands of miles from the location of his target. Until recently, there’s been a widespread belief that such remote-control assaults have rendered war impersonal, and that those pulling the trigger are relatively free of the psychological and emotional toll of killing another human being. Gavin Hood’s Eye in the Sky goes a long way towards debunking that misconception as it examines, with a clear and unequivocal eye, the pressures and stresses experienced by those involved in an operation to eliminate a trio of terrorists. The story takes place in four locations – three of which are thousands of miles from the ground on which the war is to be waged. It’s a war on terror, of course, a military arena wholly unrecognisable from those of the territorial wars of the 20th Century. In Kenya, three terrorists high on the most wanted list gather in a modest house, unaware that, high above them, a drone is monitoring their movements. In the UK, Colonel Katharine Powell (Helen Mirren – The Debt, RED), who has been hunting one of the terrorists for six years, co-ordinates the mission with ground troops in Kenya. Observing Powell’s operations from an office in Whitehall is her superior officer, Lieutenant General Frank Benson (Alan Rickman – Harry Potter and the Philosopher’s Stone, Gambit), who is in the company of two politicians, a political aide, and a legal advisor. 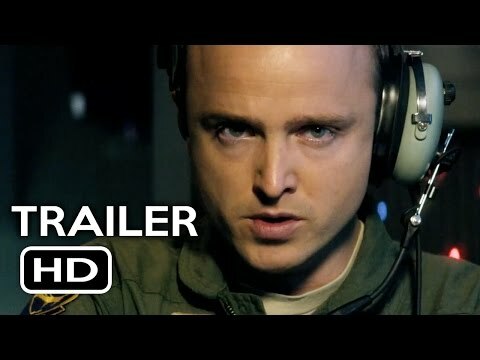 Finally, on an air base in Las Vegas, Steve Watts (Aaron Paul) operates the drone providing images of the site in Kenya, and facial recognition expert Carrie Gershon (Phoebe Fox) identifies the characters that it tracks. The straightforward ‘locate and capture’ mission becomes less clear-cut when images provided by a mobile surveillance camera disguised as a flying bug, and operated by a ground agent (Barkhad Abdi – Captain Phillips) just yards from the building in which the terrorists are gathered, observes two men in the building climbing into suicide vests loaded with explosives. What was a capture mission now becomes a kill one, but just as the military is prepared to drop a hellfire missile, a young girl sets up a bread stall directly outside the perimeter of the building. The girl will almost certainly become a fatality if they strike, so the operation is thrown into chaos as the politicians struggle with the legal, political and moral issues arising from dropping a bomb knowing that it will, in all probability, kill a young child. Eye in the Sky packs one hell of a punch for a film comprising mostly of a bunch of people sitting around desks and talking, and opens one’s eyes to the immense emotional burden involved in what many see as an impersonal – and therefore emotionally detached – aspect of modern warfare. Although he knows nothing about that young girl, Watts, the man who must instruct Gershon to pull the trigger once the missile is locked on its target, has plenty of time to watch her as she goes about her daily life, demonstrating how the killing of a person from a distance of thousands of miles is, in many ways, more personal than dropping a bomb from a plane flying a few thousand feet overhead. Coupled with this emotional assault, we share a mounting sense of frustration with Powell as she impatiently waits for the politicians viewing developments from an office in Whitehall to make a decision regarding whether or not to strike. Nobody seems to want to make the decision as they fret over whether any tactical advantage gained is worth the fallout from possible negative publicity regarding collateral damage, and responsibility for the decision is pushed further and further up the hierarchical chain. It’s noticeable that the higher up that chain they go, and the more remote from the reality of the situation the politician is, the less concerned they are about the moral implications. Without giving anything away, it’s fair to say that the outcome of Eye in the Sky is never really in doubt, but that doesn’t prevent it from mining a compelling scenario from the first minute to the last. Scenes as tense as any found on a cinematic battlefield follow one another in short order, and the first rate cast give convincing performances. Mirren makes the most of an unusually meaty role for a woman of a certain age (it was originally written for a man, apparently), and Alan Rickman, in his last live-action role before dying of cancer, gives us a dignified and quietly droll swan-song Cynics might question the probability of some reactions from military personnel while under instructions from a superior (although there’s no denying the increased levels of PTSD reported by drone pilots, as publicised in the media), and the soul-searching of politicians might be difficult to take for an audience raised to believe that they are all power-hungry egotists – but that’s simply an indication of the intelligence behind the conceiving and writing of Eye in the Sky.